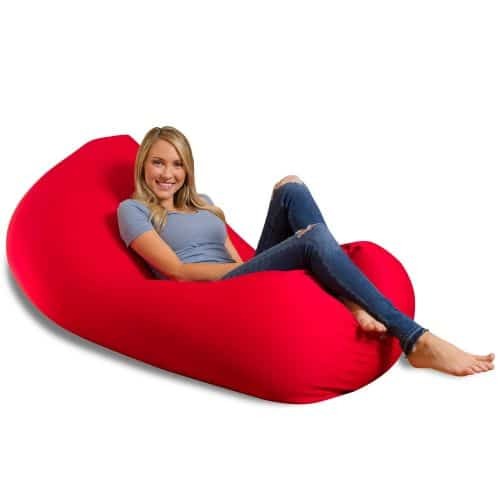 Are you looking for the softest, squishiest (sounds like a worm) and most comfortable bean bag in the market? Well, that’s the definition that Big Squishy thinks best suits their bean bag chairs. Well, we’ll give to them for softness. These chairs are as soft as they come. And there are three varieties to pick from. This is the large lounger. As made evident by the name, this is for the entire family. It is 68-inches long x 36-inches wide and the seating area is 16-inches tall above the ground. It is oval shaped and can easily seat three adults side by side or a bunch of rambunctious kids. If you are like us, you will just use it as a comfy bed instead and lie flat out on it. There’s a smaller one called the medium lounger and a one-person bean bag chair called the twister. All of these are available in 5 bright colors in muted as well as bright shades. Big Squishy uses a micro-bead filling in their chairs which is more comfortable than normal beads. In fact, it feels a little like shredded memory foam because it automatically adjusts to the shape of your body eliminating pressure points. So, if you are guilty of spending an entire day lazing on your best bean bag chair, then the Big Squishy will be one of your best picks. No sore booty! Also, the micro beads are lighter than memory foam. This will be a portable chair that you or your kids can move around your house if need be. It has a removable and machine-washable outer cover and an inner cover that prevents the beads from escaping and taking over your home. Some customers that we spoke to, found the Big Squishy chairs too hard because when filled to capacity, the outer cover fits snugly over the inner one and there’s very little or no play. The inner cover also makes it easy to refill the beads when they go flat and customize the filling to your liking. Will need to be refilled after a while. Some people find it too firm. That’s subjective though. And you can always remove some of the beads to make it softer.